Liz McCall here, and I wanted to show off Cathy's toy-themed tree she put up at the shop! Everything on the tree is either an ornament made to resemble a classic toy or game--or is one! She uses the battery powered candle lights because one of our cats--who shall not be named--has a nasty habit of chewing on the wires if we use regular bulbs, so these are safer. So many fun things on the tree, I don't know which is my favorite! As part of Seasons Readings, comment below naming one toy you spotted on the tree in the video, and include your email in a safe format. [myname (at) provider (dot) com]. 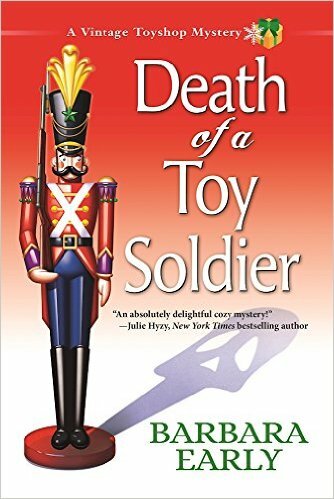 A winner will be chosen at random after noon (Eastern) on December 1st, and will receive their choice of DEATH OF A TOY SOLDIER or MURDER ON THE TOY TOWN EXPRESS, in their choice of format. 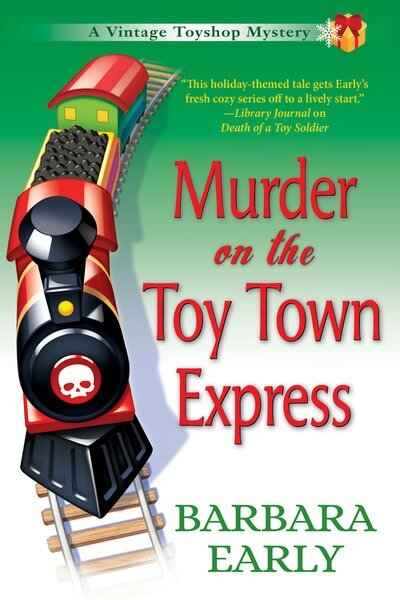 Read more about Liz McCall—toy shop manager and amateur sleuth—in the Vintage Toyshop mysteries! And you can now subscribe to Barbara Early's newsletter. A barrel of monkeys is always fun. I used to find them all over the house. I saw Mrs POtato Head. I love the alphabet block garland and the clue game, complete with pieces! Thanks! I spotted CLUE which my cousins taught me to play when I stayed with them many years ago when their dad was stationed at Spook Central (Ft. Mead,Md). I also saw Monopoly which I always lost. I saw Clue - I loved it as a child because I couldn't get my hands on enough Nancy Drews, Hardy Boys, Trixie Beldens, etc.! So many games that bring back so many memories. The tinkertoy and Lincoln logs were family faves and one that I played often in the late 50's and still have and still played until the accident 23 yrs ago was jacks. I still have the jacks and ball that Mom bought me when I was 10. I taught my kids how to play as well. With the same set. Thanks for the trip down memory lane. I am particularly impressed by all the miniature board games. Clue with the pieces! That was a great little video! The tree was perfect, full of all the best toys! The first thing I noticed was the tinker toy garland with the great alphabet wooden blocks. Then the slide show started and I was ooooing through the whole thing wanting to play! I saw a fresh box of 64 Crayola crayons. This was always a favorite Christmas gift in my childhood. Such happy memories came soaring back while visiting the Vintage Toy Tree. Thanks for the memories! The Clue game and a holiday Barbie ornament. I saw an Operation game. This was a great video and brought a smile to my face. Thank you! aut1063(at)gmail(dot)com. a Rubics Cube,Fisher Price Telephone, See and Say, Raggedy Ann and Andy and a Sorry game. My Little Pony and Monopoly. What an adorable tree! Made me so nostalgic. Monopoly, Operation, Barbie, Mr. Potato Head, Tinker Toys, Etch -A-Sketch. I especially loved the Fisher-Price barn. I remember my kiddos having all those Fisher-Price sets years ago. Thanks for the cute video and the giveaway. So many cute ornaments. I think my favorites are the Clue game & Candyland game. I saw my alktime favorite game, Clue. I love the miniature board games like Clue and Monopoly, but then there are the Fisher Price toys like the Barn and the Telephone. How can you pick just one?! Clue and Monopoly and my Fisher Price barn, Sorry, couldn't name just one, must add a tinker toy too. So many great toys and memories! Monopoly I love that game...I always tried to win Park Place..thank you for the chance. Tinker Toys, Raggedy Ann & Andy, Howdy Doody... so MANY awesome ones- I love it! Oh my goodness so many memories with just a sight of a toy! Where do I start? Well, guess I'll start with my memories - the bathing suit Barbie, Lincoln Logs, Mr. Potato Head, Tinker Toys, Gumbo, Wooly Willy (which was a great travel toy) and Howdy Doody. Then there are the toys from our daughter's span - the Fisher Price clock, Play Fun Farm House and Chatter Telephone as well as the games of UNO, Candyland, See and Say, and Simon. Thanks for the memories! Oh my goodness, I loved so many of the ornaments on that tree! Uno, Monopoly, the slinky dog, lincoln log house, play-doh and so many other fun things! I saw a rubic's cube---I think we still have one in the house someplace. I saw a fisher price little telephone. thank you for the chance!! There was so many that brought back so many good memories. The Mystery Machine, Raggedy Ann, Fisher Price Barn, Monopoly Game and Candy Land and Clue ad so many more. I love the tree.